It’s the holiday season! Already!!! And now it’s time to get serious about planning a variety of tablescapes for parties you will host throughout the season. Let’s kick it off with one whose elements of warm, glowing fire and crisp, cold ice are perfect all winter through (sans the tree, perfect for New Year’s Eve or any January tablescape)…for not a lot of money! This room was transformed to a warm but wintry haven for my “Tablescaping a Winter Wonderland” class taught through MCC-Longview. While this table is a “square” made from two 6-ft. oblong tables kissed together horizontally, the same effect could be easily achieved on a 72-in. round table using a round mirror. This table can seat up to 12 depending on whether or not a charger is used and how much stemware and flatware is at each place setting. Rather than traditional snowy white linens which would work just as well (as would pewter or silver with a few tweaks), I opted for creamy ivory from LinenTablecloth.com. 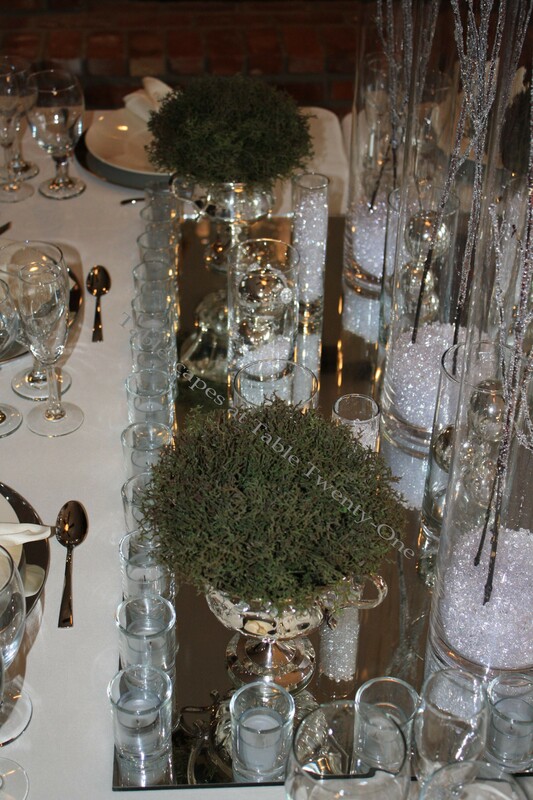 Each place setting is anchored with a 13″ mirrored charger from Hobby Lobby. (Buy these when they’re 50% off!) Bone white 10 Strawberry Street dinner plates are from Tuesday Morning, and the J.A. Henckels very contemporary “Bellaserra” flatware can be found at Macy’s. 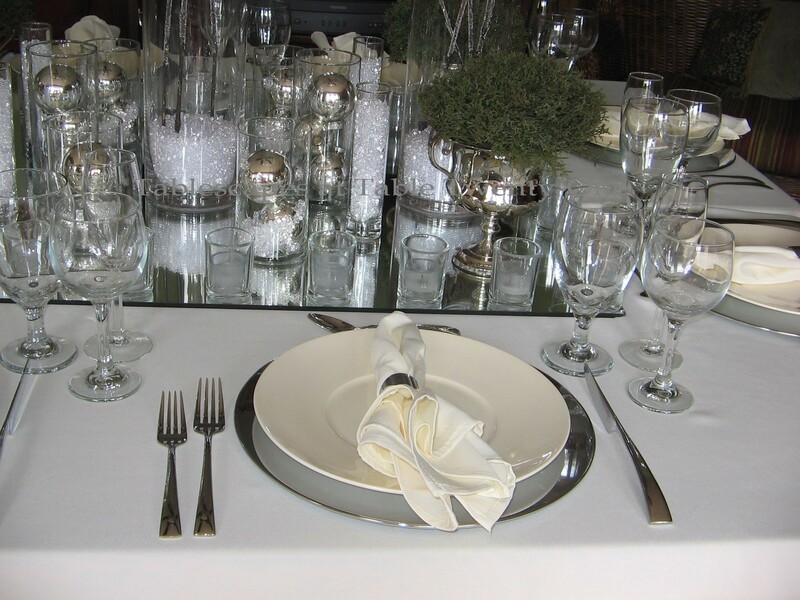 An ivory napkin with a sleek silver napkin ring rounds out the place setting. 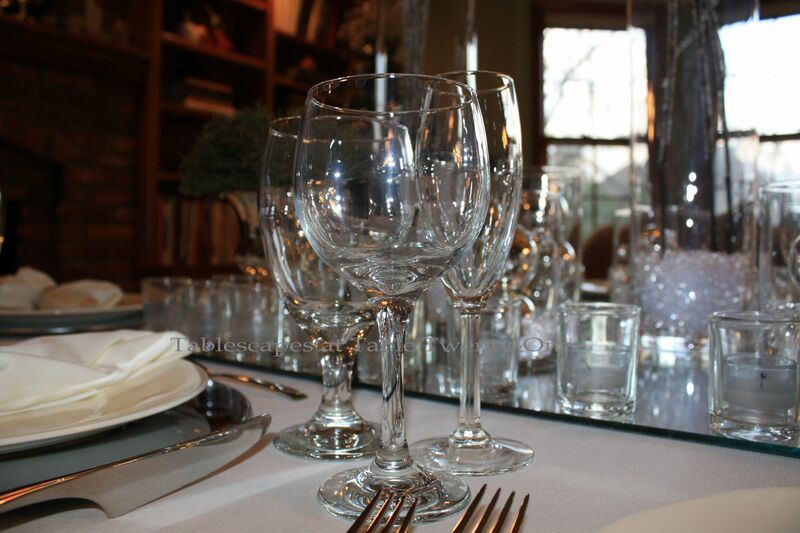 Clear glass stemware is from Old Time Pottery. It goes on sale for 99¢ per stem fairly often, and I keep it around by the case for entertaining large groups. 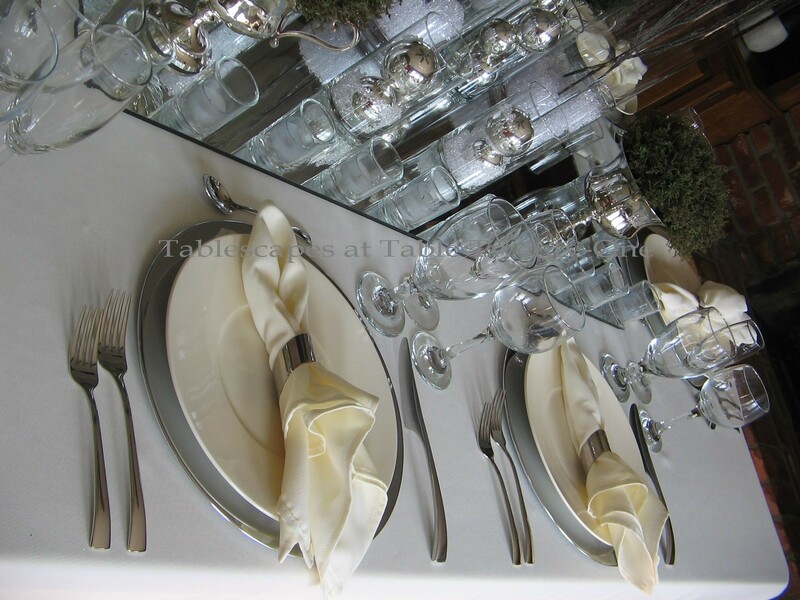 The style is so versatile and works for both casual and formal tables. 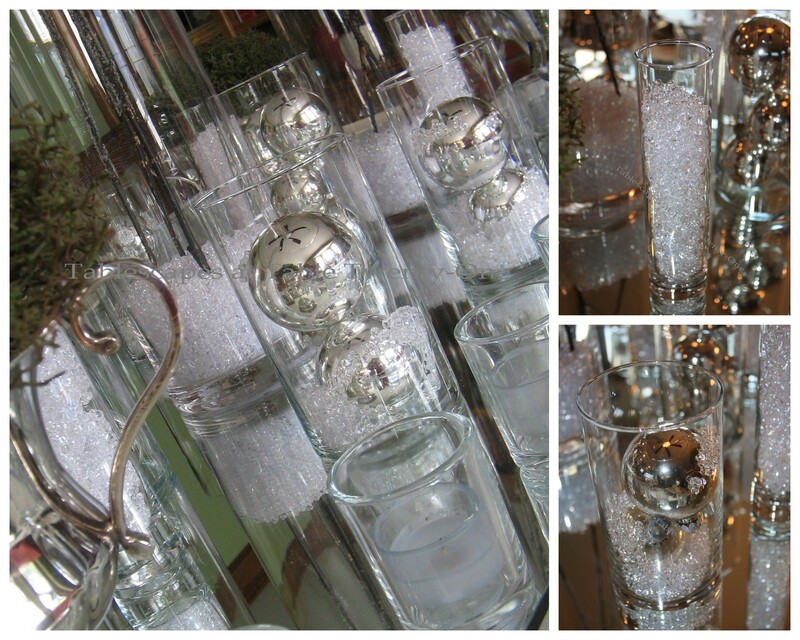 To break up the expanse of glass across the mirror, I anchored the four corners with these silver urns. If silver urns aren’t in your budget, try spray painting clay pots. 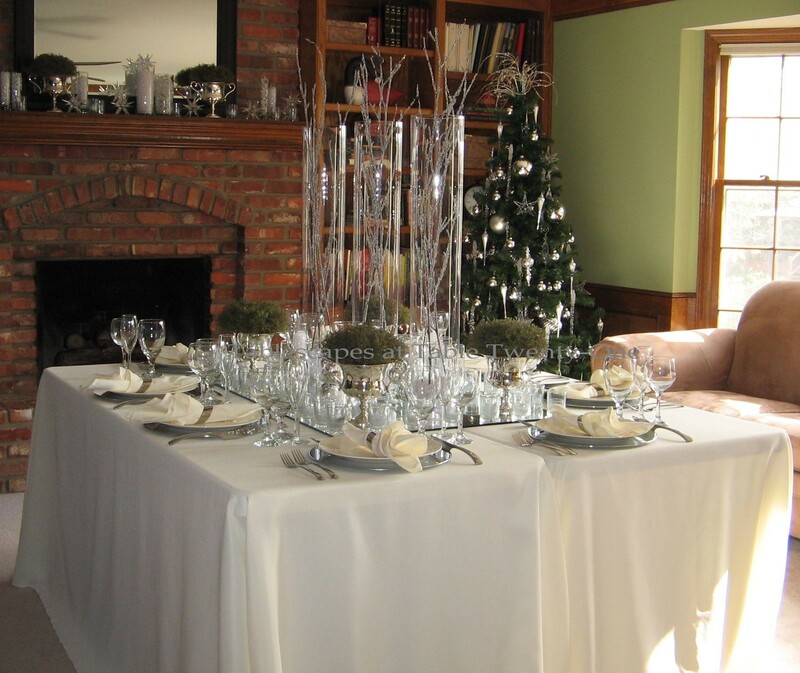 The evergreens bring in another wintertime element, are a splash of nature, and are the only real “color” on the table. Buy evergreens that can be planted in your yard at a later date to get more bang for your buck. Now this is where the drama is taken to a whole other level: the votive candles!!! Line them up like a fiery fortress around the perimeter of the mirror. This is a relatively inexpensive way to add ambiance, glow and sass to your tablescape. Notice the shape of the votive holders is the same as the taller glass cylinders for a uniform look. Don’t skimp here. The more the merrier! I always like to dress the fireplace mantel with decor that reflects what’s going on on my table. 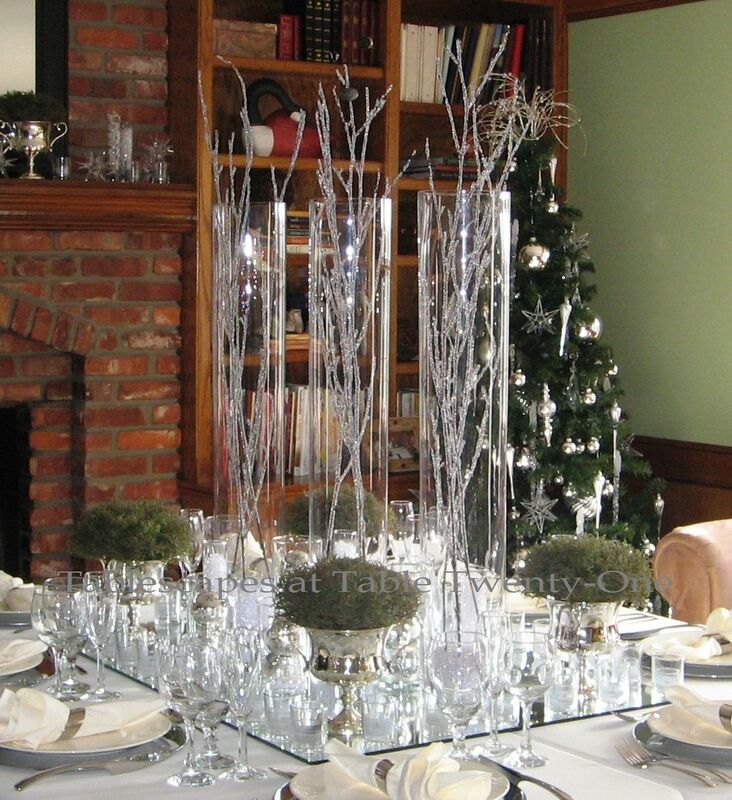 Here it is decorated with more glass cylinders, some of which are filled with icy garland and others with the same “ice” used on the table. A smattering of clear acrylic Moravian stars – some stacked on top of each other just for fun! – bring shape and more shine to the vignette. (I had no idea these were called Moravian stars until my sweet blog buddy, Jewel of Carolina Jewel’s Table told me!) Notice how the silver urns with evergreens are repeated here. Votive candles finish the look and add warmth. So this is the first of many Christmas tablescapes created as a teaching tool for my students. Stay tuned for more in the coming weeks! I’m so excited to join my fellow tablescapers on a couple of the really fun blog parties again this week including Cuisine Kathleen’s “Let’s Dish!” (anytime after 6:00 p.m. CST on Wednesday) and Susan’s “Tablescape Thursday” (anytime after 9:00 a.m. CST on Thursday). This is drop-dead gorgeous! I can’t believe that even your tree is very coordinated. You look great, too! This is so sophisticated and elegant ~ I just love it! The whole theme makes me want to wear a light gray sheath, paint my nails silver and wear silver slippers. I’ll bring the wine too! Or should I bring champagne??? All of that fire and ice looks so very elegant! No blazing yule before us in the fireplace? (In the video.) It must have been 70 degrees the day the video was taken. 😉 Love the snowman headband!! Alycia – you are a huge inspiration to me. This tablescape is over-the-top gorgeous! Thanks for sharing your gift with the world! Glitz and glamour! Your fire and ice tablescape is so pretty! All the silver and glass with the mirror makes for a wonderful display! I’m ready- what time is dinner!! I can’t believe all the decorating and tearing down you’ve already done! You should be burnt out for the holidays already! This table must look spectacular all lit up! Beautiful job! I like how you use mirrors to reproduce the images and lights. Happy Holidays for you and your Lovely Family! Love all the sparkle Alycia! The tree looks fabulous,too, especially with you standing there with it! Love your smile. It really is nice to be able to run with the theme on the mantle and on the tree! Lovely! All I can say is….WOW !!! Wow, Alycia, this is beautiful! Everything looks so festive and wintry! The white and silver are just stunning. Love how you’ve tied everything together! Alycia, that is just too gorgeous. Stunning with the lights down. It’s just gorgeous! I left my music on while watching the video, and it made it even more enchanting. I love all the glass and silver. I have never decorated with silver around here at all, and I really want to. I’ve just been stuck in gold mode and am too cheap to start buying silver. Your table just sparkles to me. The glittery branches and all the ornament balls are just perfect against that mirror. (I know I have the perfect mirror to use around here, but as i was looking at yours, I started to fear that it left with the Great Purge of 2012. Oh, I hope it didn’t!! Beautiful Alycia~ Even more so with the lights down low and candles aglow! I’m a big fan of buying real plants for the table and then planting them in pots outside after they’ve graced the table. 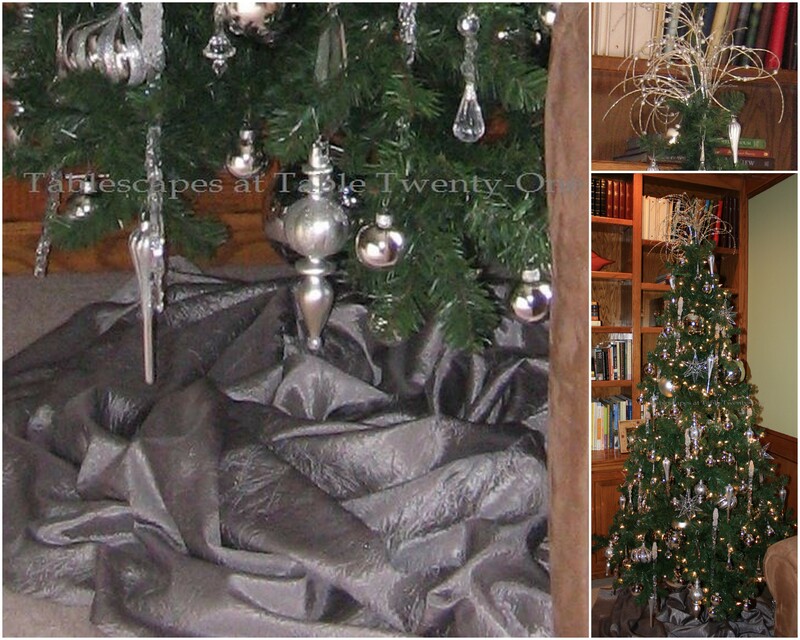 Scrunching a tablecloth or fabric as a tree skirt is a perfect solution too! 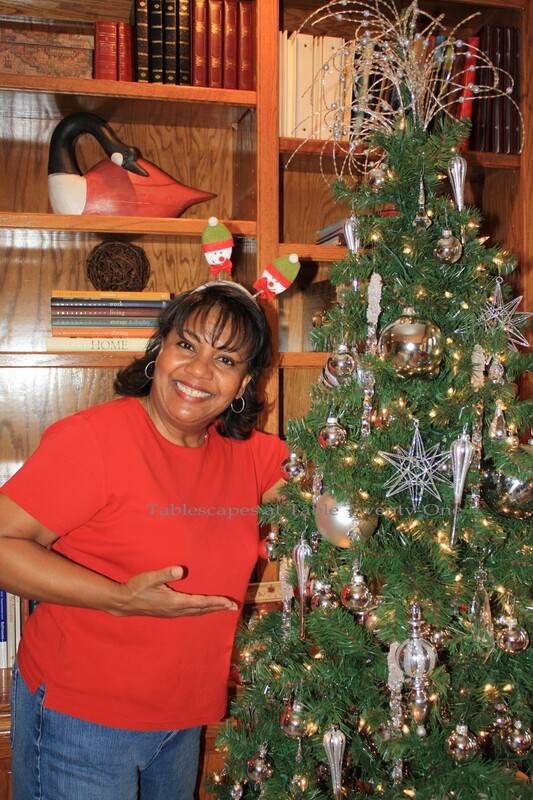 You’re so photogenic and cute standing by your tree~ I had to chuckle at “Santa, Mama needs a new wardrobe” :)Thanks for making me Merry! Simply gorgeous! Love the simplicity in colors! And all of the candles 🙂 The video adds a great touch with the music playing. Well done! Oh, girl, your students must be in total overload by now. How lucky they are to be exposed to so many ideas. It would be great fun to see how they incorporate what they have learned into their own thing. This table is totally for the ice princess with its glamour and icy beauty. Hope Santa has better luck finding you a new wardrobe than I did finding one for myself. 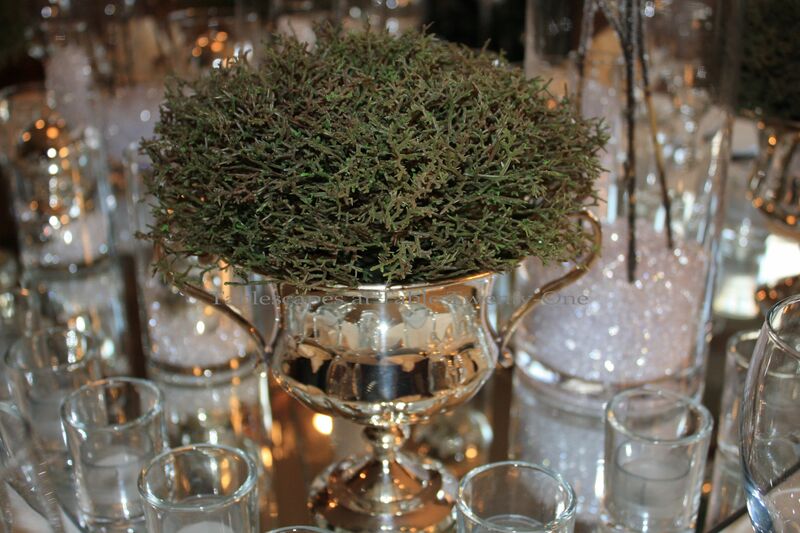 I think the touch of real greens in the silver urns is brilliant and brings everything to life. Sometimes silver and white palettes can be harsh and cold. 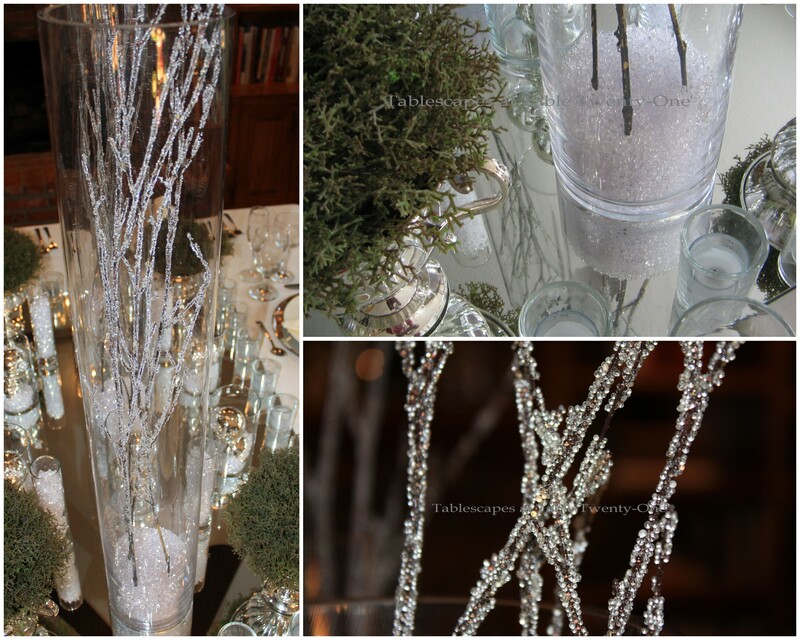 I also love the simple treatment of glittery branches in the tall glass cylinders…well, I love everything! Thanks for so many lovely inspirations. This gorgeous Fire and Ice table and Johnny Mathis too! S’cuse me, I am going back to the video. Absolutely took my breath away Alycia! I keep scrolling up and down to take it all in. I love using mirrors on the table but you really amped it up using a big ole bathroom mirror! Genius! Alycia, I have missed visiting you. Whenever you post your beautiful table, my jaw drops. Thank you for sharing your talent with us! Beautiful, beautiful, beautiful, love all the sparkle! I really want some of those tall cylinders, but storage may be a bit of a problem…darn. The beaded branches are pretty neat, too. I am another that thanks you for sharing your talent/creativity with us each week, Alycia. Very very pretty! Love the icy branches in the cylinders. It’s all so elegant! Alycia, you are something else, dear friend! Wow, is what I have to say!! I love how you place two tables together. That centerpiece is spectacular. I love using the mirror and putting all the votives around. Those tall cylinders are fabulous. Another winner, my dear!! Hi A. ! Love your table, very sophisticated indeed! Love all the shimmer and sparkle. It would be wonderful for New Year’s Eve too. I think of you every time I see those tall cylinders in Michael’s! You do such a great job, the mantel looks wonderful too! love love loooove the mantle, all wintry and shiny! Exquisite in every angle as I see from far beyond. How much more in the real life? Your table is fabulous! I just love the size with the two tables put together and the length of the cloth just sets it off. The mirror in the center is wonderful. You always make me jealous that I can’t come to your class. I am sure that it is so much fun! All of the wonderful candleholders in the center are just fabulous! What a beautiful contemporary table. Love it all! Great idea making a square table like that! I actually have two matching tables and never thought of “kissing” them together – thanks for the great idea! I love the glass cylinders with the baubles in them on the mirror. Super WOW factor! Your acrylic stars are called Moravian stars here in NC. Old Salem is a restored Moravian village inside modern city Winston-Salem. 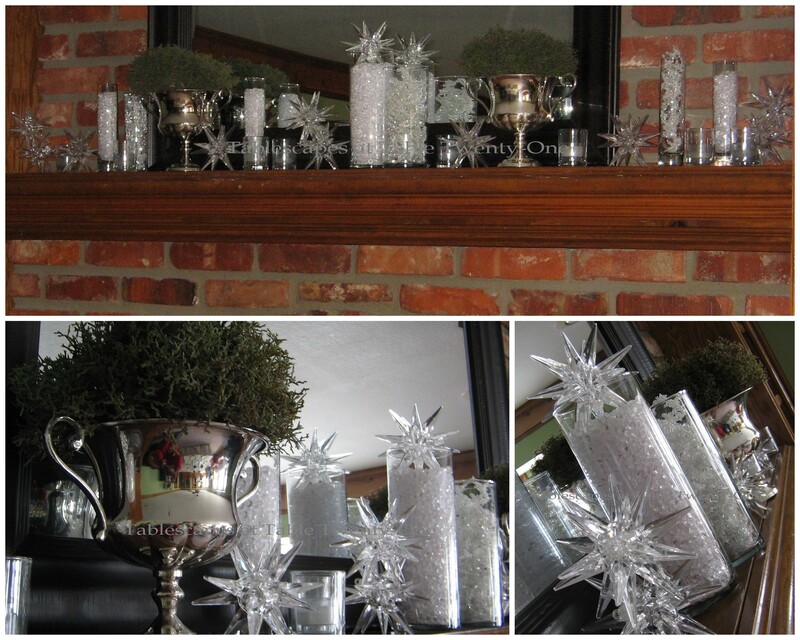 Love how you have used the Moravian stars on your mantle. And I also love the silver urns – I have several old silver creamers and sugar dishes that would work as an urn fill-in! Great ideas Alycia! PS Love your headband – you are just too cute! Gorgeous and oh, so, classy! I love how you pulled everything together! It makes quite an ampact! Truly magical. You have quite a gift my dear. Fondly, J. Very sophisticated and elegant all the candles are just perfect. Thanks so much for sharing the video. So very pretty. It’s frosty and icy looking so is just perfect for the season. Hi Alycia! I really appreciate you taking time to comment on my White Christmas tablescape. I’m new to blogging and am enjoying connecting with other creators. I love your site. I’ve looked through your tablescapes many times before for inspiration. Thanks! Oh, Alycia! This table is wonderful! I was thinking of doing a plaid tablescape this Christmas Eve, but I only have enough place settings for 8 and 1 plaid tablecloth and I really didn’t want to buy another tablecloth! Suddenly, it seems that my guest list may increase, but I won’t know for sure, probably until a week before Christmas!!! That’s a good thing, of course. I love my family, but I was racking my brain on what to do if I do end up with more people than I originally thought. Your solution is just perfect! I already own beautiful, white linen tablecloths. I just may have to “borrow” some of your ideas . . . Thank you for the inspiration! I LOVE the idea of setting a table in the living room next to a roaring fire. I did this once for a birthday party because we needed extra seating and everyone seemed so timid and worried about dirty-ing it up in there….. I also love the mirror as a “runner” will need to keep my eye open for something that can work the next time I’m at Goodwill!! !